Capt Paul David Derby was born on 04 Jan 1943 in Marshfield, Fond du Lac, Wisconsin, as the first child of Charles H Derby and Ramona E Creed. When he was 22, He married Dorothy Marie Wormet, daughter of Dennis A. Wormet and Ellen Louisa Avery, on 23 Jan 1965. They had two children; Scott Paul Derby, born in Pensacola, FL, and Pamela Faye Derby, born in Cherry Point, North Carolina. 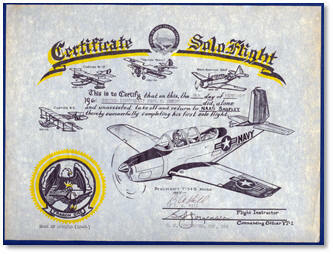 Paul realized his dream of becoming a jet fighter pilot in February of 1967, when he received his wings in Mississippi. His first assignment was to Cherry Point, North Carolina. He was sent to Vietnam in 1968. Only months later, both Paul and his co-pilot died on 17 Nov 1968 in Quang Nga Provence, Vietnam, when the jet he was piloting was struck by enemy fire and crashed. Paul's body was never recovered. 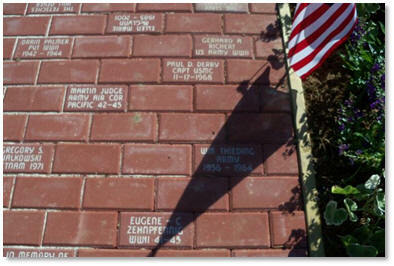 A memorial was dedicated to Paul at the Rock Island National Cemetery in Rock Island, Illinois. He also has a place on the Virtual Wall Vietnam Veterans Memorial and the Wall in Washington DC, which honors those who died in the Vietnam War. 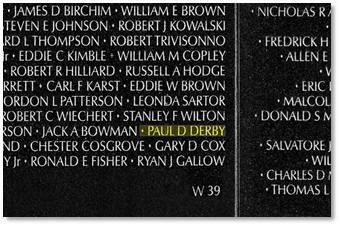 Paul D. Derby is on the wall at Panel 39W Line 077. Thank you Paul! I would have liked to shake your hand! 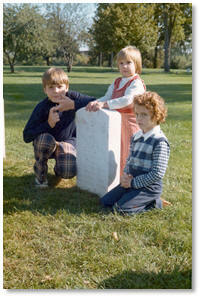 Paul was the husband of my 2nd cousin, Dorothy Marie (Wormet) (Derby) Franczyk. 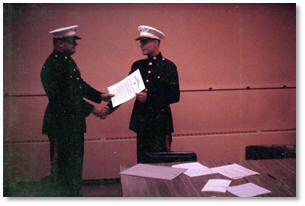 Paul entered the Marine Corps in September 1965. He attended Officer’s Candidate School in Quantico, Virginia. 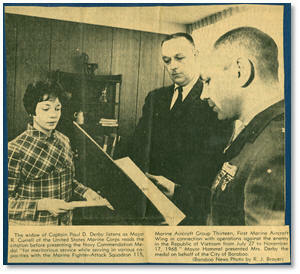 He received his commission upon graduation from Stout State University, July 1965. 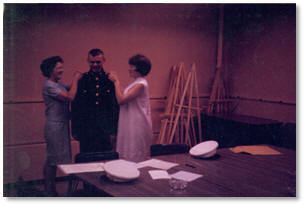 Paul’s mother, Ramona E. (Creed) Derby, and Dorothy pinning on his bars at the commissioning ceremony. “It was the third week in November, 1963, at Stout State University. Paul and I were to have our first date Saturday night. President Kennedy was shot on Friday, November 22, 1963. When I heard the news, I wanted to go home, as did most of the students. Although it was not considered proper for girls to phone boys back then, but I called Paul to inform him I was going home. He always teased me about breaking our first date. Neither of us ever dated anyone else after that day. 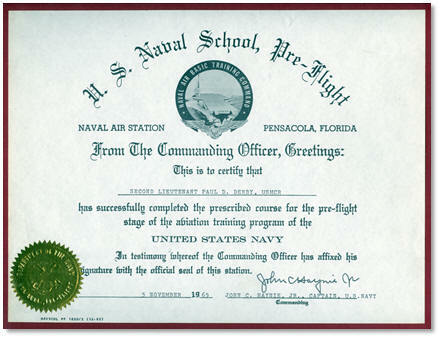 Paul’s Pre-Flight Training Certificate received from the United States Naval Air Station in Pensacola, Florida on November 5, 1965. After his flight training, Paul received further jet training in Meridian, Mississippi, and Kingsville, Texas. He received his wings as a fighter pilot at Corpus Christi, Texas in February 1967. 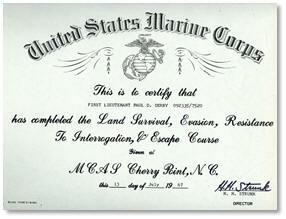 Paul’s certificate of completion for the Land Survival, Evasion, Resistance to Interrogation, and Escape Course on July 13, 1967. Pilot 3/c Charles A. Derby (left) graduated from the procurement specialists’ school at Lowry AFB, Colorado, and is home on leave until March 18, 1967, when he will report for duty with the 6417th Combat Support Group in Taiwan. He is a graduate of Columbus High School and entered service last September 21. 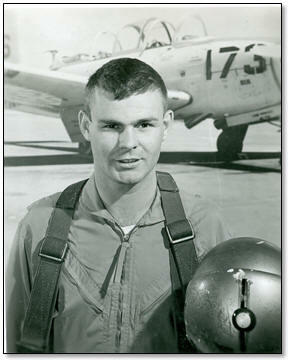 First Lt. Paul D. Derby, Marine Corps jet fighter pilot, got his wings Feb. 17, 1967, at Corpus Christi, Texas. He is a graduate of Columbus High and Stout State University-Menomonie and entered service in September 1965. He and his wife are visiting in Baraboo en route to his new assignment at Cherry Point, North Carolina. The pilot and his wife are also visiting her parents, Mr. and Mrs. Erman Willfahrt. Charles A and Paul D Derby, the two sons of Mr. and Mrs. Charles D. Derby in their uniforms. an electrician on the jets in Vietnam. The photo was shared by Amber Gregg, David's daughter. 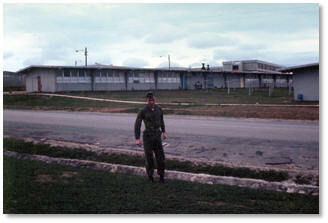 Paul’s assignment was to Cherry Point, North Carolina, where he was stationed until he was sent to Vietnam in July 1968. 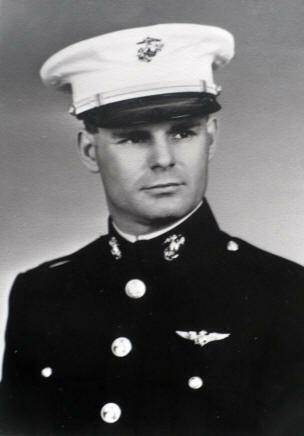 Captain Paul Derby served with Marine Fighter-Attack Squadron 115, a unit of the First Marine Aircraft Wing. He arrived in Vietnam in July 1968. The following history paints a picture of what was happening just before, and when he served in Vietnam. 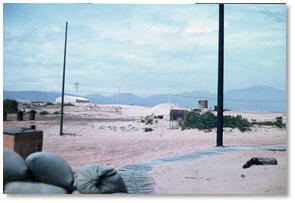 He was stationed at Chu Lai, Vietnam. There, the squadron found itself engaged in support missions. During the last four months of 1967, the Silver Eagles flew a total of thirty-three missions. 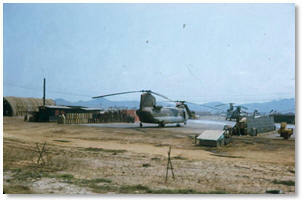 Sorties ranged from the area through the DMZ into the southern panhandle of North Vietnam. 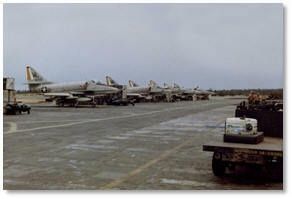 By 1968, some of the officers had passed the 200-mission mark. 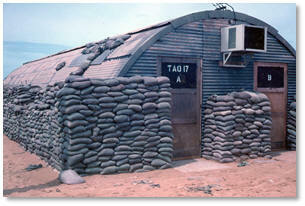 Combat hours per month for the squadron reached a high of 721 and sometimes averaged in excess of 500 hours per month. 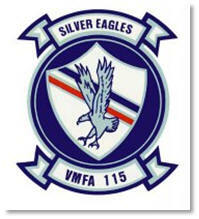 Soon, several pilots in the Silver Eagles were passing the 300-mission mark. Several Air Medals were being awarded, as well as recommendations for Bronze Stars. 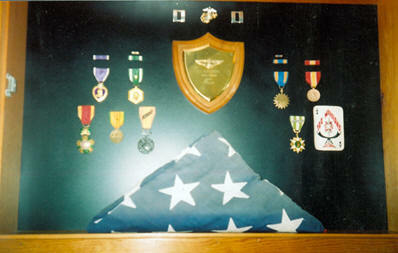 The squadron’s awards include the Navy Commendation Medals, Vietnamese Crosses of Gallantry, Distinguished Flying Crosses, Single Mission Air Medals, Navy Achievement Medals, and Purple Hearts. When Captain Paul Derby arrived that Summer, squadron efforts continued at a high level, with the monthly operations averaging 600-700 combat flight hours. The squadron continued to pile up very impressive mission totals, but at a price. On 13 July, Captain John C. Hurst and First Lieutenant Leonard A. Bird were killed. They were flying a close-air support mission when their aircraft was observed bursting into fire and crashing near Khe Sanh. 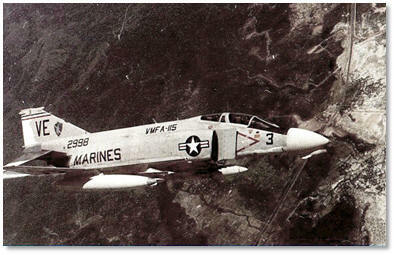 The squadron also received additional ground training, even during combat. Squadron personnel were sent to such locations as the Jungle Escape and Survival Training Course in the Philippines; Sea Survival School in Japan. Forward Air Controller School at Okinawa; Non-commissioned Officer Leadership School; Corrosion Control Course; Nuclear, Biological, and Chemical Warfare School; KY 28 (secure voice radio equipment) School; and the H-7 Rocket Ejection Seat School. Paul’s view from his front door. 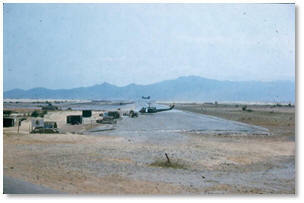 The diversions for the squadron included rest and recreation (R&R). 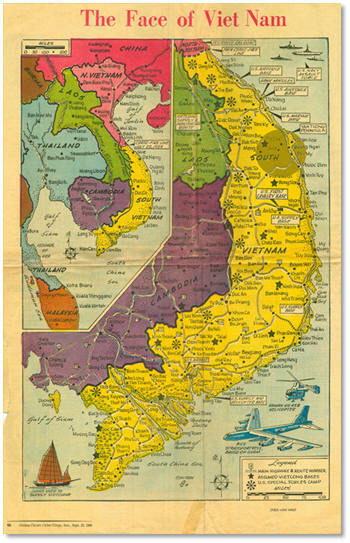 Leave permitted personnel to visit Australia, Malaysia, Thailand, Formosa, Hong Kong, and Hawaii. In addition, the Post Exchange featured good buys on sought after stereo equipment. The Red Cross workers came for visits, and an Enlisted Men’s' Club was available for use. On 21 September 1968, Captain Robert F. Conley Jr. and First Lieutenant Steven R. Major were killed when their aircraft crashed, apparently hit by enemy fire while flying on a close-air-support mission near Phu Bai. The Command Chronology for the squadron for the month of October shows the effect one Marine air unit can have on the overall ground effort. For example, the units supported by VMFA-115 during October included: 1st Reconnaissance Battalion; 7th Marines; 11th Marines; 24th Marines; 26th Marines: Task Force Hotel; American Division; ROK Marines; and the 51st ARVN Regiment. On 8 October 1968, Captain Joseph W. Jones III and Captain Daniel J. Coonon were killed in a crash as a result of enemy action while on a close-air-support mission near Da Nang. In October, the squadron's on-hand aircraft strength rose to 16 after the some improved planes were returned after some modifications in Japan. These improvements included the new H-7 rocket seat with ground ejection capability, and the incorporation of utility hydraulics for the flight control system. New survival radios for aircrew members were also distributed. Lieutenant Colonel Robert R. Norton assumed command of the squadron on 28 November 1968. Combat flight hours rose dramatically from 411 in November to 739 in December. Paul is standing to the left, below the star on the wing. The difficulty of some of the missions was seen in a quote from the December command chronology: “The flight, working under a 2,200-foot ceiling in mountainous terrain with friendly troops 150 meters from the target and ground fire in the area, destroyed eight structures in a fortified village.” Hazardous duty such as this brought casualties. On November 17, 1968, Captain Paul D. Derby and First Lieutenant Thomas A. Reich were killed while on a close-air-support mission southwest of Chu Lai. 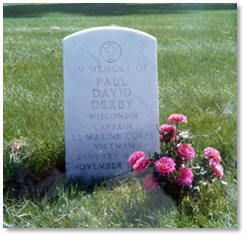 Captain Paul David Derby had been in Vietnam for only four months! 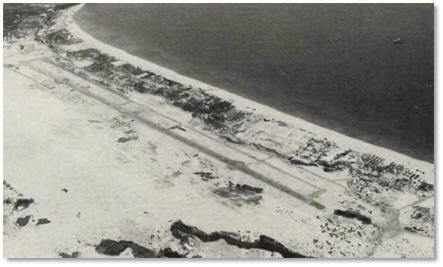 The circle is the area where Paul’s jet went down. Medals named below, left to right. 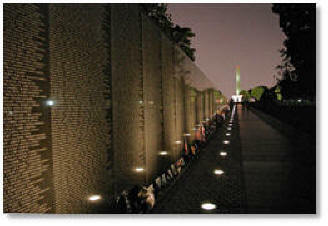 The Virtual Wall Vietnam Veterans Memorial and the Wall in Washington DC honors those who died in the Vietnam War. 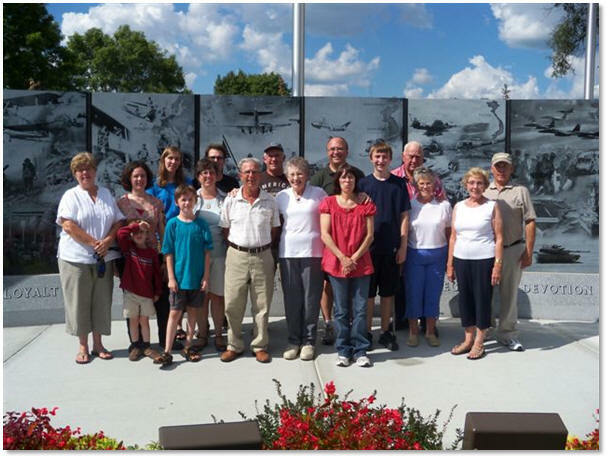 The William Avery Family had a picnic at the Veteran’s Memorial in Reedsburg, WI in September 2011. A memorial stone was purchased for both William Avery and Paul Derby. 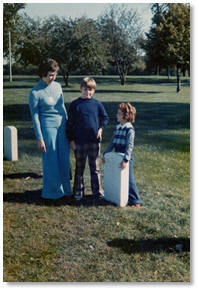 Erin Miller had seen my online memorial for Paul and had contacted me to find out who she could talk to concerning Paul. 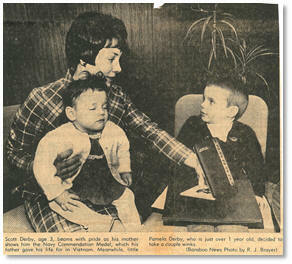 I had contacted Dorothy (Wormet) (Derby) Franczyk and with time…Paul’s story for the book was written. Paul is one of those 37. 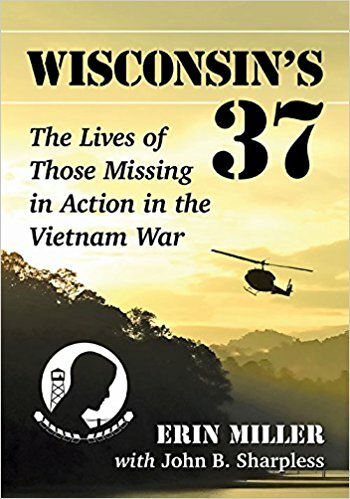 "Wisconsin's 37: The Lives of Those Missing in Action in the Vietnam War"
This the soon-to-be-released book by Erin Miller.